Submitted Photo Pictured from the left are Michael Longley, county planning; County Executive George Borrello, Rosie Strandburg, county planning; Mark Odell, county legislator; George Spanos, director of county Department. of public facilities; Drew Rodgers, county department of public facilities. Missing from photo is Don McCord, director of county planning). Chautauqua County recently announced it has been designated a Clean Energy Community by the New York State Energy Research and Development Authority (NYSERDA), recognizing its leadership in reducing energy use, cutting costs and driving clean energy locally. Announced by Gov. Cuomo in August 2016, the $16 million Clean Energy Communities initiative supports local government leaders across the state by providing grants to eligible municipalities to implement energy efficiency, renewable energy and sustainable development projects in their communities. Clean Energy Communities advances the Governor’s Reforming the Energy Vision (REV) strategy by demonstrating the importance of communities in helping New York reach its Clean Energy Standard mandate of having half of the state’s electricity coming from renewable energy resources by 2030. Chautauqua County received the Clean Energy Community designation for completing four of 10 high-impact clean energy actions identified by NYSERDA as part of the Clean Energy Communities initiative. The designation gives Chautauqua County an opportunity to apply for up to $150,000 toward additional clean energy projects, with no local cost share. In 2016, an Energy Committee, comprised of both public and private sector stakeholders, was tasked by the County Executive to review the Energy Cluster section of Chautauqua County’s 2020 Comprehensive Plan to explore current energy positioning, reliability, and opportunities. Mark Odell, chairman of the Energy Committee, said “At our formation meeting we looked at the map of New York State, which showed where Clean Energy and Climate Smart Communities in the state were located. At that time, Chautauqua County and the whole Southern Tier was a sea of white with no activity. We quickly knew that we had some serious work to do. With the assistance of the Southern Tier West Regional Planning Board, we gained a better understanding of what the program entailed and what steps we needed to take. 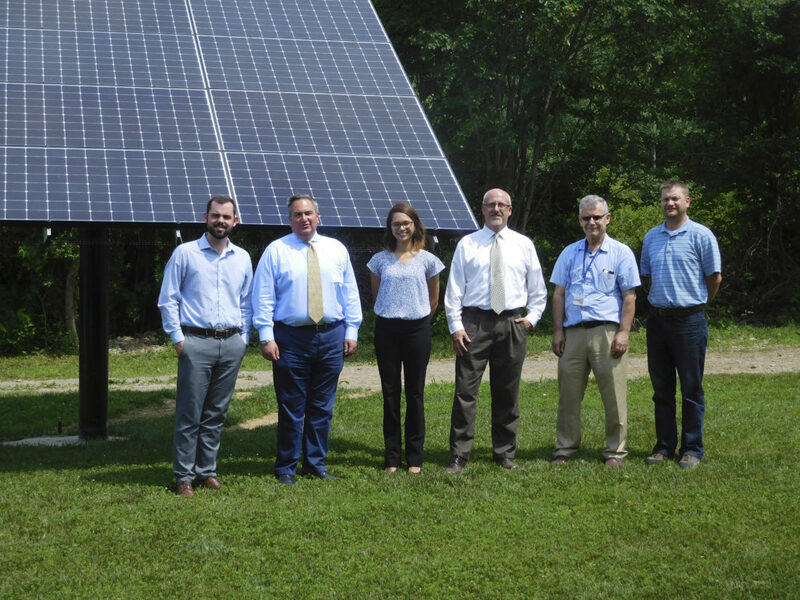 Through the collaborative efforts of the County’s Division of Planning and Community Development and the Department of Public Facilities over the past 18 months, Chautauqua County was able to attain its Clean Energy Community designation by NYSERDA. Adopted an energy benchmarking policy to track and report energy use in the County’s municipal buildings. Deployed two all-electric, heavy-duty trucks in the County’s municipal fleet and installed two electric vehicle charging stations. Participated in Solar Chautauqua, a Solarize campaign to encourage homeowners to install solar panels. Established an Energize NY Finance Program that enables long-term, affordable financing for energy efficiency and renewable energy projects at commercial buildings and not-for-profits in the County. Cities, counties, towns and villages that complete at least four of 10 high-impact clean energy actions are designated Clean Energy Communities and are eligible to apply for funding of up to $250,000 with no local cost share and the option of receiving up to 25 percent paid in advance to support additional clean energy projects. At least two of the four actions must have been completed after August 1, 2016. NYSERDA is accepting applications for funding on a rolling basis through Sept. 30, 2019 or until funds are exhausted, whichever comes first. Funds are being provided through the Clean Energy Fund and the Regional Greenhouse Gas Initiative. ¯ Performing energy efficiency and renewable energy upgrades to municipal buildings. ¯ Implementing Community Choice Aggregation (CCA) so residents can gain greater choice and control over energy use as a group. ¯ Earning Climate Smart Communities Certification through the Department of Environmental Conservation (DEC) for developing a comprehensive program to reduce its carbon footprint and improve the environment. ¯ Streamlining local approval processes for solar projects through adoption of the NYS Unified Solar Permit. ¯ Converting streetlights to energy efficient LED technology. ¯ Providing energy code enforcement training to code officers. For more information on Clean Energy Communities, visit www.nyserda.ny.gov/cec. For assistance navigating the program, local government officials or employees can find contact information for their respective coordinator on NYSERDA’s website at www.nyserda.ny.gov/Contractors/Find-a-Contractor/Clean-Energy-Community-Coordinators.